^ 2.0 2.1 The Binary Stars, Robert Grant Aitken, New York: Dover, 1964, p. ix. ^ Herschel, William. Catalogue of 500 New Nebulae, Nebulous Stars, Planetary Nebulae, and Clusters of Stars; With Remarks on the Construction of the Heavens. Philosophical Transactions of the Royal Society of London. 1802, 92: 477–528 . Bibcode:1802RSPT...92..477H. JSTOR 107131. doi:10.1098/rstl.1802.0021. ^ 4.0 4.1 4.2 Heintz, W. D. Double Stars. Dordrecht: D. Reidel Publishing Company. 1978: 1–2. ISBN 90-277-0885-1. ^ 5.0 5.1 Visual Binaries. University of Tennessee. ^ Heintz, W. D. Double Stars. Dordrecht: D. Reidel Publishing Company. 1978: 5. ISBN 90-277-0885-1. ^ Heintz, W. D. Double Stars. D. Reidel Publishing Company, Dordrecht. 1978: 17. ISBN 90-277-0885-1. ^ 8.0 8.1 8.2 The Binary Stars, Robert Grant Aitken, New York: Dover, 1964, p. 1. ^ Vol. 1, part 1, p. 422, Almagestum Novum, Giovanni Battista Riccioli, Bononiae: Ex typographia haeredis Victorij Benatij, 1651. ^ A New View of Mizar, Leos Ondra, accessed on line May 26, 2007. ^ pp. 10–11, Observing and Measuring Double Stars, Bob Argyle, ed., London: Springer, 2004, ISBN 1-85233-558-0. ^ pp. 249–250, An Inquiry into the Probable Parallax, and Magnitude of the Fixed Stars, from the Quantity of Light Which They Afford us, and the Particular Circumstances of Their Situation, John Michell,Philosophical Transactions (1683–1775) 57 (1767), pp. 234–264. ^ Heintz, W. D. Double Stars. Dordrecht: D. Reidel Publishing Company. 1978: 4. ISBN 90-277-0885-1. ^ Account of the Changes That Have Happened, during the Last Twenty-Five Years, in the Relative Situation of Double-Stars; With an Investigation of the Cause to Which They Are Owing, William Herschel, Philosophical Transactions of the Royal Society of London 93 (1803), pp. 339–382. ^ p. 291, French astronomers, visual double stars and the double stars working group of the Société Astronomique de France, E. Soulié, The Third Pacific Rim Conference on Recent Development of Binary Star Research, proceedings of a conference sponsored by Chiang Mai University, Thai Astronomical Society and the University of Nebraska-Lincoln held in Chiang Mai, Thailand, 26 October-1 November 1995, ASP Conference Series 130 (1997), ed. Kam-Ching Leung, pp. 291–294, Bibcode: 1997ASPC..130..291S. ^ "Introduction and Growth of the WDS", The Washington Double Star Catalog, Brian D. Mason, Gary L. Wycoff, and William I. Hartkopf, Astrometry Department, United States Naval Observatory, accessed on line August 20, 2008. ^ Sixth Catalog of Orbits of Visual Binary Stars, William I. Hartkopf and Brian D. Mason, United States Naval Observatory, accessed on line August 20, 2008. ^ The Washington Double Star Catalog 页面存档备份，存于互联网档案馆, Brian D. Mason, Gary L. Wycoff, and William I. Hartkopf, United States Naval Observatory. Accessed on line December 20, 2008. ^ Heintz, W. D. Double Stars. Dordrecht: D. Reidel Publishing Company. 1978: 17–18. ISBN 90-277-0885-1. 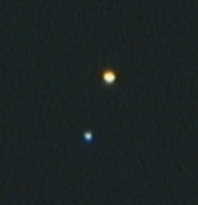 ^ Binary Stars. Cornell Astronomy. ^ The Binary Stars, Robert Grant Aitken, New York: Dover, 1964, p. 41. ^ Herter, T. Stellar Masses. Cornell University. （原始内容存档于2006-07-18）. ^ Gossman, D. Light Curves and Their Secrets. Sky & Telescope. October 1989: 410. ^ Eclipsing Binary Simulation. Cornell Astronomy. （原始内容存档于2008-06-23）. ^ Bruton, D. Eclipsing Binary Stars. Stephen F. Austin State University. ^ Bonanos, Alceste Z. Eclipsing Binaries: Tools for Calibrating the Extragalactic Distance Scale. 2006. arXiv:astro-ph/0610923 [astro-ph]. ^ Worth, M. Binary Stars (PowerPoint). Stephen F. Austin State University. ^ Lev Tal-Or; Simchon Faigler; Tsevi Mazeh. Seventy-two new non-eclipsing BEER binaries discovered in CoRoT lightcurves and confirmed by RVs from AAOmega. 2014. arXiv:1410.3074. ^ Bock, D. Binary Neutron Star Collision. NCSA. （原始内容存档于2007-06-26）. ^ Astrometric Binaries. University of Tennessee. ^ Nguyen, Q. Roche model. San Diego State University. （原始内容存档于2007-03-23）. ^ Robert Connon Smith. Cataclysmic Variables. Contemporary Physics. November 2006, 47 (6): 363–386. Bibcode:2007astro.ph..1654C. arXiv:astro-ph/0701654. doi:10.1080/00107510601181175. ^ Neutron Star X-ray binaries 互联网档案馆的存檔，存档日期2008-12-10., A Systematic Search of New X-ray Pulsators in ROSAT Fields, Gian Luca Israel, Ph. D. thesis, Trieste, October 1996. ^ Iorio, Lorenzo. On the orbital and physical parameters of the HDE 226868/Cygnus X-1 binary system. E-print. July 24, 2007, 315 (1-4): 335. Bibcode:2008Ap&SS.315..335I. arXiv:0707.3525. doi:10.1007/s10509-008-9839-y. ^ Black Holes, Imagine the Universe!, NASA. Accessed on line August 22, 2008. ^ Heintz, W. D. Double Stars. Dordrecht: D. Reidel Publishing Company. 1978: 19. ISBN 90-277-0885-1. ^ Binary and Multiple Star Systems. Lawrence Hall of Science at the University of California. （原始内容存档于2006-02-07）. ^ pp. 307–308, Observing and Measuring Double Stars, Bob Argyle, ed., London: Springer, 2004, ISBN 978-1-85233-558-8. ^ Entry 14396-6050, discoverer code RHD 1AB，The Washington Double Star Catalog 互联网档案馆的存檔，存档日期2007-08-03., United States Naval Observatory. Accessed on line August 20, 2008. ^ References and discoverer codes, The Washington Double Star Catalog 互联网档案馆的存檔，存档日期2008-04-13., United States Naval Observatory. Accessed on line August 20, 2008. ^  - see essential notes: "Hot companion to Antares at 2.9arcsec; estimated period: 678yr." ^ Kenyon, S. J.; Webbink, R. F. The nature of symbiotic stars. Astrophysical Journal. 1984, 279: 252–283. Bibcode:1984ApJ...279..252K. doi:10.1086/161888. ^ Iping, Rosina C.; Sonneborn, George; Gull, Theodore R.; Massa, Derck L.; Hillier, D. John. Detection of a Hot Binary Companion of η Carinae. The Astrophysical Journal. 2005, 633 (1): L37–L40. Bibcode:2005ApJ...633L..37I. arXiv:astro-ph/0510581. doi:10.1086/498268. ^ 48.0 48.1 Rowe, Jason F.; Borucki, William J.; Koch, David; Howell, Steve B.; Basri, Gibor; Batalha, Natalie; Brown, Timothy M.; Caldwell, Douglas; Cochran, William D.; Dunham, Edward; Dupree, Andrea K.; Fortney, Jonathan J.; Gautier, Thomas N.; Gilliland, Ronald L.; Jenkins, Jon; Latham, David W.; Lissauer, Jack J.; Marcy, Geoff; Monet, David G.; Sasselov, Dimitar; Welsh, William F. Kepler Observations of Transiting Hot Compact Objects. The Astrophysical Journal Letters. 2010, 713 (2): L150–L154. Bibcode:2010ApJ...713L.150R. doi:10.1088/2041-8205/713/2/L150. ^ 49.0 49.1 van Kerkwijk, Marten H.; Rappaport, Saul A.; Breton, René P.; Justham, Stephen; Podsiadlowski, Philipp; Han, Zhanwen. Observations of Doppler Boosting in Kepler Light Curves. The Astrophysical Journal. 2010, 715 (1): 51–58. Bibcode:2010ApJ...715...51V. doi:10.1088/0004-637X/715/1/51. ^ Boss, A.P. 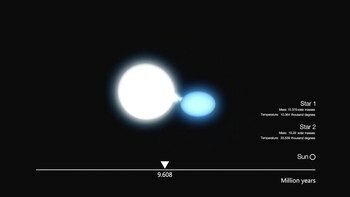 Formation of Binary Stars. (编) （eds.）J. Sahade, G.E. McCluskey, Yoji Kondo. The Realm of Interacting Binary Stars. Dordrecht: Kluwer Academic. 1992: 355. ISBN 0-7923-1675-4. ^ Kopal, Z. The Roche Problem. Kluwer Academic. 1989. ISBN 0-7923-0129-3. ^ "Contact Binary Star Envelopes" by Jeff Bryant, Wolfram Demonstrations Project. ^ "Mass Transfer in Binary Star Systems" by Jeff Bryant with Waylena McCully, Wolfram Demonstrations Project. ^ Boyle, C.B. Mass transfer and accretion in close binaries - A review. Vistas in Astronomy. 1984, 27: 149–169. Bibcode:1984VA.....27..149B. doi:10.1016/0083-6656 (84)90007-2 请检查|doi=值 (帮助). ^ Enigma of Runaway Stars Solved. European Southern Observatory. ^ Prialnik, D. Novae. Encyclopaedia of Astronomy and Astrophysics. 2001: 1846–1856. ^ Icko, I. Binary Star Evolution and Type I Supernovae. Cosmogonical Processes. 1986: 155. ^ Fender, R. Relativistic outflows from X-ray binaries（a.k.a. `Microquasars'）]. Bibcode:2002LNP...589..101F. arXiv:astro-ph/0109502. ^ Schombert, J. Birth and Death of Stars. University of Oregon. ^ Schirber, M. Planets with Two Suns Likely Common. Space.com. 17 May 2005. ^ The First Black Hole. University of Toronto. （原始内容存档于2008-03-07）. 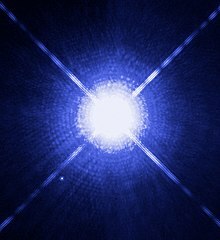 ^ McGourty, C. Hubble finds mass of white dwarf. BBC News. 2005-12-14 [2010-01-01]. ^ Planetary Systems can form around Binary Stars. Carnegie Institute. 2006. （原始内容存档于2011-05-15）.